Sterling Silver, Coral and Sleeping Beauty Turquoise. 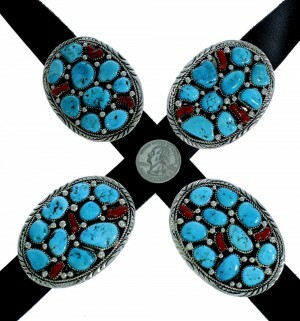 Each concho piece measures approximately 1-7/8" long and 2-5/8" wide. 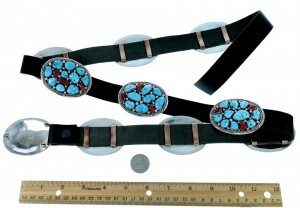 Total belt length measures approximately 50-7/8" long and 1" wide. The belt weighs 421 grams. 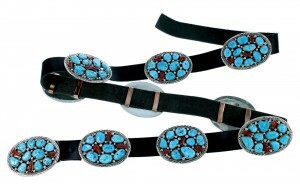 This concho belt is a beautiful piece of wearable art! 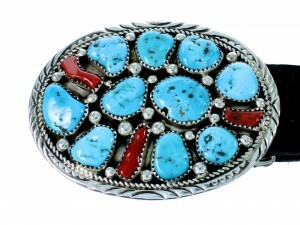 This piece of Native American jewelry is Navajo hand crafted by artist Marie Thompson out of genuine sterling silver along with real Turquoise stones and real Corals. The entire belt has a total of ONE HUNDRED and TWENTY-ONE stones. 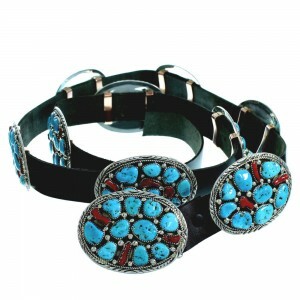 The belt features TEN concho pieces that each have an average of TWELVE stones. All of the stones are gently placed in hand cut bezel settings while a stunning combination of twisted silver, mini silver beads, and stamped designs accents and completes the belt perfectly. The concho buckle is stamped sterling and hallmarked.